How to Catch a Bogle by Catherine Jinks is the start of a new trilogy. Birdie is the apprentice to Alfred Bunce, a bogler. 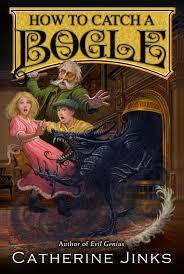 Mr. Bunce’s job is to kill bogles or monsters that eat children. Birdie, his apprentice, is used as baits to lure the bogles out so that Alfred can kill them. Add Mrs. Eames, a socialite who is interested in bogles, Sarah Pickles a women who uses children as pick pockets to earn her living and Dr. Morton who ? A fun read. Remember that to ask about Arthur and Merlin.